Katriona provides team building singing events for many businesses. These events can take the form of workshops or singing classes for corporate functions and can be tailored to your company. 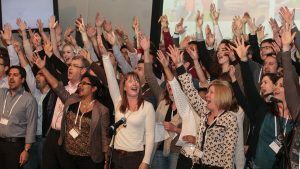 Whether your team is a small outfit of 10 or less, or a large organisation involving hundreds, singing together will enable colleagues to work in harmony and listen to each other. Katriona’s fun singing sessions are structured activities in the workplace and they are designed to promote team work and bonding as well as providing an activity that staff can enjoy. The process of singing and learning to sing, especially in a group, is highly motivational, fosters creativity, enhances morale, creates a sense achievement and is great fun! It also builds confidence and presentation skills. Katriona’s team building singing events are tailored to fit the time you have available, your budget and your aims.